Аэрос - "Rigid Wing "
We had 2 competitions in 2010 in Japan so far. Primoz Gricar placed first flying a new Phantom. Stan Roberts flying on a Phantom set new New York State record 177 miles! Combat L pilots win the biggest hanggliding rally! The Practice Europeans: Aeros representatives win the first two places! The Aeros Demo Days before and after Pre Europeans. A tremendous work has been done. Stalker Rigid Wing has been embodied already. It was extremely different from existing types owing to a number of advanced design solutions, namely. The main thing is control in roll and lateral control through ailerons as well as pilot's weight shift control. Flying Stalker one has the same feeling as flying a hang glider. High control efficiency. Smooth wing D-spar not covered with dacron. 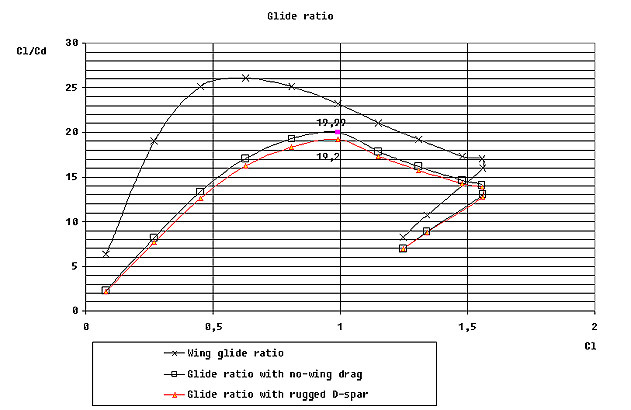 Elementary calculations show 0.5-0.9 points improvement in glide ratio quality. (See the chart). Rigid specially shaped tip secures minimum inductive resistance within the wide speed range. A wingtip does not warp in flight, and due to this the predetermined lateral profile twist angle is preserved at all flight modes. 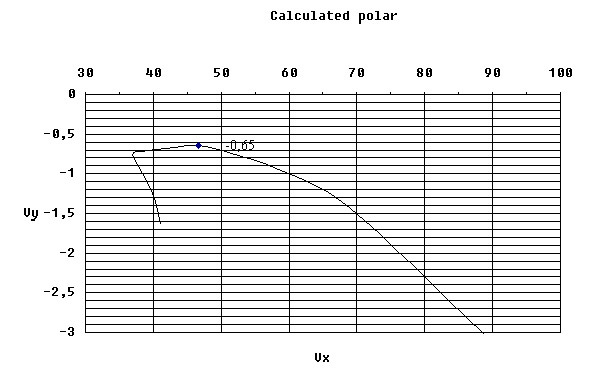 Aileron alignment angle changes in flight, thus reducing power on the speedbar at high speed. This causes increase in speed range, better lift-drag ratio at high speed. 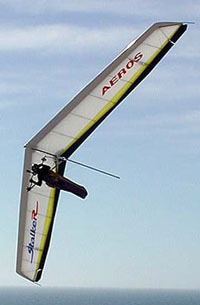 Wing flap and aileron are an extension of a wing profile. There is absolutely no gaps and steps between them and the wing profile. Effective wing flap allowing stable flight even at the speed 25 km/h. 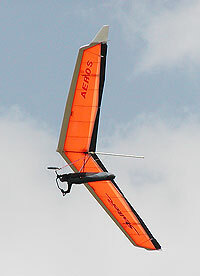 Rigid wing's weight does not exceed that of a kingpostless hang glider. Quick and easy folding into two or one package. Results of a prototype flight tests have shown as follows. Takeoff and landing are extremely smooth even at complete calm. At takeoff the wing starts flying immediately, being obedient to the pilot, and easily reaches takeoff speed. At landing it is necessary to maximally reduce speed and after this to push the speedbar. The glider will land at once without nose sinking. Most important is not to push the speedbar too early. The wing is quite stable and controllable at towing, it is not difficult to tow it at bumpiness and to fly with any towing device at speed range 50 - 90 km/h. Stalker picks up speed very easily, provides a steady flight at high speed. Efforts on the handle are not big. During testing speed of 130 km/h has been achieved, and this was not the limit. Besides, there were absolutely no speed bumps. Minimum speed with a completely deflected flap was 25 km/h.